The federal government is heading toward a record $480 billion deficit in 2004 and will rack up red ink of almost $1.4 trillion over the next decade, according to the latest analysis by the Congressional Budget Office. The estimate may even break the half-trillion dollar mark, a newspaper reports. 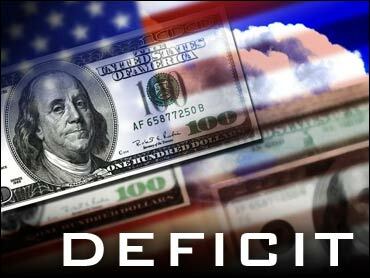 Congressional aides with access to the CBO report said it also confirms earlier estimates that the federal deficit for the fiscal year ending Sept. 30 will be $401 billion, well above the previous record of $290.4 billion set in 1992. The 2004-2013 deficit estimate of $1.397 trillion by the nonpartisan office reverses previous predictions that the federal budget, battered by economic recession and rising defense and security costs, would edge back into the black over the coming decade. According to The New York Times, the CBO will actually provide two estimates. One ignores the cost of the military missions in Iraq and Afghanistan, which are running at a combined $4.9 billion a month. Another assumes that war costs this year will continue at the same amount for the next 10 years. Both assumptions are considered somewhat unrealistic. The method assuming a 10-year war cost could push the deficit over $500 billion. Besides defense costs, Democrats were quick to cite the Bush administration's tax cuts for the government's financial problems. In its last budget estimates in March, the CBO predicted that the deficit would be $246 billion this year, but would move gradually back toward the black and result in an accumulated surplus of $891 billion in the 2004-2013 period. But the latest figures, reflecting the rising costs of the military campaign in Iraq, are certain to be more pessimistic. Even before the report was released, congressional Democrats on Monday argued that the CBO numbers underestimate the coming deficits because the office generally does not anticipate future changes in spending policy. The Bush administration's drive to pass new tax cuts and make existing tax breaks permanent, coupled with efforts to give seniors a Medicare prescription drug benefit and meet sharply rising defense costs, will eliminate the possibility for a return to surpluses in the next decade, they said. "It is clear that these estimates will provide yet more evidence of the nation's fiscal deterioration under the irresponsible tax cut and spending policies of the Bush administration," said Sen. Kent Conrad of North Dakota, top Democrat on the Senate Budget Committee. The Budget Committee Democrats said their analysis shows that the deficit will hit $495 billion in 2004, and will never go below $300 billion in the 2004-2013 period, reaching a total over the decade of $3.7 trillion. If money from the Social Security surpluses now being used to pay for other federal programs is not factored in, the decade-long deficit will be $6.3 trillion, they said. Sean Spicer, spokesman for House Budget Committee Chairman Jim Nussle, R-Iowa, disputed the Democratic conclusions, saying Republicans do have a blueprint for getting the budget back in balance. He said the keys were promoting a strong economic recovery and controlling federal spending and "we're trying to do both." The Bush administration has blamed the swift reversal from budget surpluses to perennial deficits to the faltering economy, the Sept. 11 attacks and the sharp rise in defense and homeland security costs. The White House says the fiscal situation will improve as the economy, bolstered by the Bush tax cuts, becomes more robust. But Rep. John Spratt of South Carolina, ranking Democrat on the House Budget Committee, contended that budget projections already assume strong growth of more than 3 percent a year over the next few years. "Even with growth we still have deep deficits getting even deeper," he said. The CBO numbers, he said, do not take into account the $1.2 trillion that will be lost if tax cuts scheduled to expire over the next decade are made permanent, and another $878 billion in new tax cuts over the decade being sought by the White House. Last month, the White House's own Office of Management and Budget estimated an even higher deficit for this year — $455 billion — and a lower one for next — $475 billion — compared to the CBO figures. This fiscal year's deficit has already exceeded the old record of $290.4 billion set in 1992 when President Bush's father was president. Republicans argue that the economy is much larger today than it was then, so the budget shortfall has less of an impact and is not a record when measured as a percentage of Gross Domestic Product. Many economists look more at the percentage of GDP than raw dollars in assessing the impact of federal budget deficits on the economy. But even at its current size, the deficit could damage the economy. Federal Reserve Chairman Alan Greenspan warned as much last month. "There is no question that if you run substantial and excessive deficits over time you are draining savings from the private sector," Greenspan told the House Financial Services Committee.